I giorni della merla, "the days of the blackbird" refers to January 29th, 30th and 31st, and are supposed to be the coldest days of the year. It is curious how this old Italian saying is still widely used in the local media and among Italian citizens, especially when we are close to the end of January. Will the giorni della merla be as cold as they are famously known for? This is what everyone seems wonder about, while they wait for the weatherman to make his predictions for this period. When the weatherman announces dropping temperatures and this year, snow, people seem to remember the legend that the nonni told them as children. There are a couple of legends which explain why these 3 days are referred to as "the days of the blackbird"1. 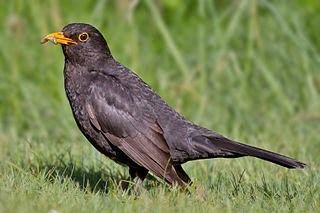 The first legend says that blackbirds (called merli in plural which makes no reference to their color) were once white. January consisted of 28 days while February had 31 days. Apparently one of these birds started chirping happily on January 28th, happy that cold January was finally over. January was so angry at the bird's behavior that it asked to borrow 3 days from February in which it unleashed snow, wind, freezing temperatures and rain. The bird hid in a chimney and when it came out it was black from the smoke. Blackbirds have been born black ever since. A simpler version of this legends states that a female white bird, a merla, and her chicks hid in the chimney during the coldest days of January to stay warm and when they came out they were black from the smoke. According to the legend, if the "days of the merla" are cold, the spring will be nice; if the 3 days are mild then spring will be late.